Check out our stretched look for 2014-later custom Baggers! We took our popular Chupa stretched fender, added more length, then we stretched the fender rearward an additional 9” to give your big wheel Bagger a super stretched profile...we call it the Super Stretch! These fenders are 3-D molded from the highest quality materials to assure a perfect fit and finish every time. They are a direct bolt-on replacement (not a skin) and utilize your stock mounting hardware. The fender will not interfere with an accessory sissy bar or tour-pack docking hardware. No cutting, shaping or drilling required… Just bolt the fender on and wire it up, it’s that easy! 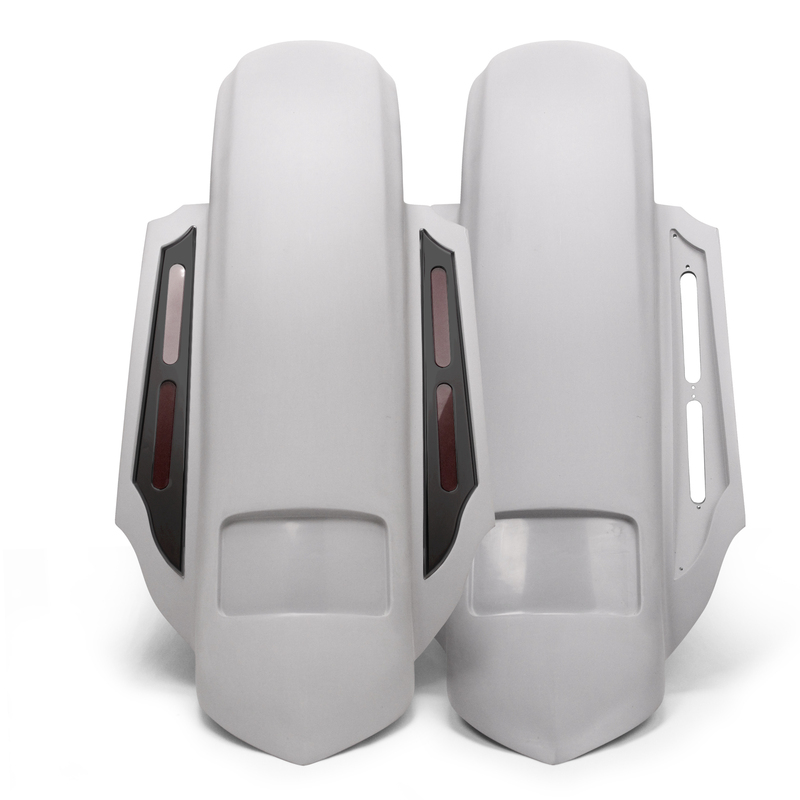 Choose smooth fillers so you can create your own custom taillight look with our Super Bright taillight options. Or, we also offer our Super Stretched Fenders with our popular Bagger Dagger lights frenched in right from the factory! Our Super Stretch Fenders are available in two tail shapes- Pleated or Rounded. Both tail shapes are available in dual exhaust OR no exhaust outlet styles, and the Bagger Nation® Super Stretch Fender is specifically designed to fit seamlessly with our Bagger Nation® Super Stretch Saddlebags on 2014-later H-D touring models. Each fender includes our frenched Stealth II license frame with hidden LED lights.